Vinegar is a natural cleaning and disinfecting element that can be used to clean nearly any area of the home, including bathtub and sink drains. 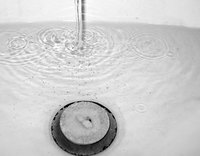 These drains can become clogged within just a few weeks when dirt, food, hair and soap scum collect as they rinse down the drain. Instead of buying an expensive drain-cleaning solution, you can use a vinegar-based cleaning routine that is natural and effective. Pour 1/4 cup baking soda down the drain. Pour 1/2 cup vinegar down the drain as well. When the vinegar and baking soda react you will notice a slight foaming. This is a normal reaction that will work to clean and unclog the drain. Cover the drain, and let the solution work for one hour. Pour a pot of boiling water down the drain to wash away the loosened buildup.